I prepared rasamalai for last Diwali potluck party and it tasted wonderful. but all them became hard after sometime as I made a small mistake while kneading and rolling the rasagullas. So when I prepared this time, I was taking extra care while kneading the chenna. As a result, all my rasamalais turned out good. Since we like rasamalai a lot, most of the time I prepare it instead of rasagullas. 1) Prepare rasagullas first. Save 1 cups of sugar syrup after preparing the rasagullas. 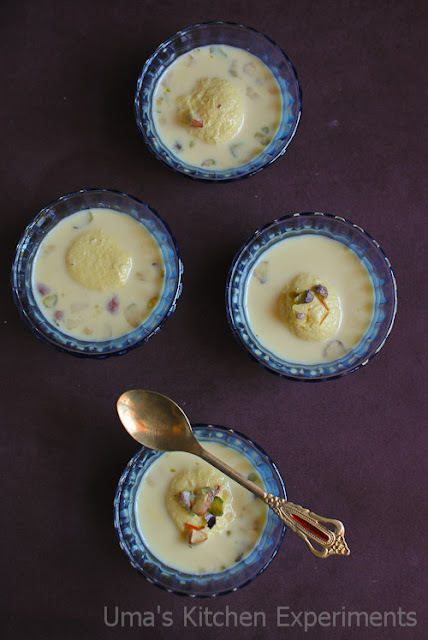 Bring the rasagullas to room temperature. Slightly press it to form like a patties. You can even use rasagullas without pressing it. Keep aside. 2) Boil milk in a thick bottom pan. 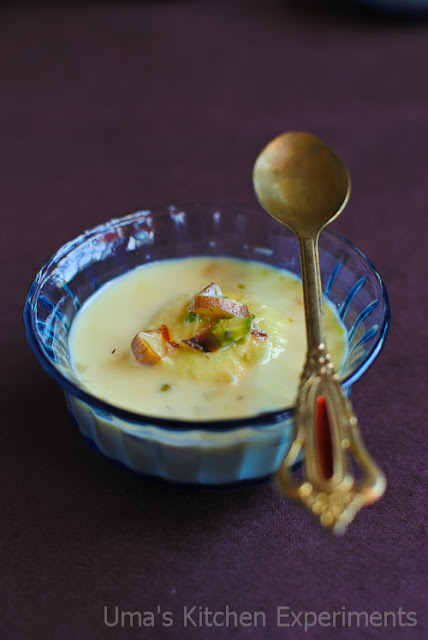 3) Soak saffron in 2 tablespoons of warm milk. 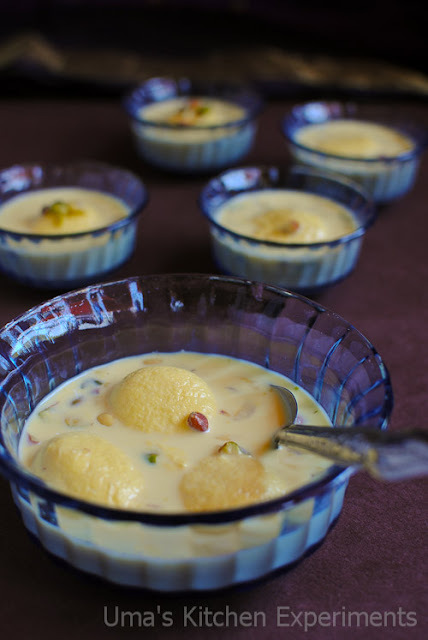 4) Add sugar syrup from rasagullas to the boiling milk(Or add sugar) and continue boiling till the milk reduces in its quantity and became thick. It took 40-45 minutes for me to reduce. 5) Add the saffron to the reduced milk. 6) Add rasagulla patties to it. 7) Add cardamom powder followed by nuts. 8) Cook for 5-10 minutes in very low flame. 9) Turn the flame off and cool to room temperature and then refrigerate it. 1) Take rasagullas from sugar syrup only when the milk is reduced to half. Slightly press it to form patties and squeeze out the excess water just before adding. This helps to get soft and spongy rasamalais. 2) Instead of a cup of sugar syrup, you can directly add 1/2 cup of sugar to the milk. Bengali Mithai makes every occasion so special.. perfect for Diwali! 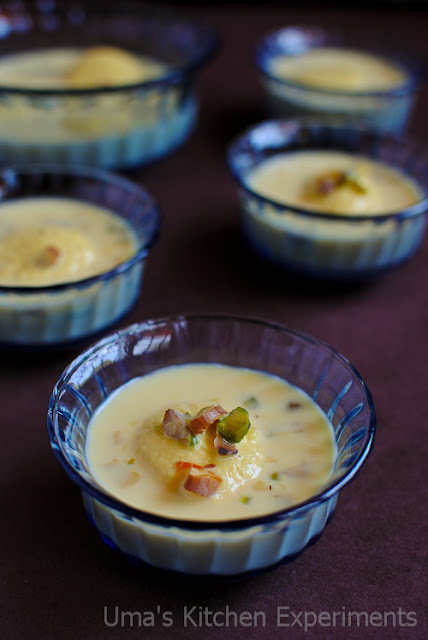 Seriously i want this irresistible,rich looking rasmalai,absolutely droolworthy. Grt job making them at home ..wonderful effort by taking sto by step clicks too. Btw I forgot to tell u ,I tried chettinadu chicken curry fom ur blog and it was delicious,I have posted it in my blog,not the rescent one,just the one before my last post .Thank u for sharing that.